It is an uncanny coincidence that the 30th anniversary of the miners’ strike should occur at a time the current Conservative government is trying to dismantle another longstanding institution, the National Health Service. Gary Clarke’s COAL, commemorating the 1984/85 miners’ strike in choreographic form, comes as a salutary reminder of how politicians who capitalise on the self-aggrandizing belief they are ‘overcoming the challenges of (the) age’ can ruin the lives of entire communities. Clarke understands this firsthand, having been brought up in Grimethorpe, a mining town in South Yorkshire. ‘It’s deeply, deeply personal, and I just wanted to share how it felt to live through these times. How it felt then, and how it feels now as the pain, loss and division linger on in our stranded communities.’ It is memory that drives the work forward. COAL is divided into three acts: the first is a slice of early-morning ritual in a single home that suggests the foundation of social life in a mining community. The wife (TC Howard) peels spuds in a bucket while the husband (Alistair Goldsmith) sleeps under a blanket; she is cook and feisty timekeeper, long-time lover and loyal supporter. 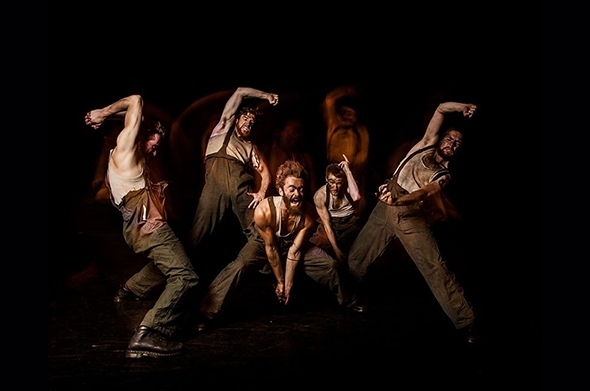 Costume and set designer Ryan Dawson Laight takes delight in the details (Howard is reading a newspaper with the headline ‘Tory Cuts’) and Clarke fashions the spirit of comradeship in an earthy dance among the assembled miners (Goldsmith, Nicolas Vendange, James Finnemore, Joss Carter and Connor Quill) on their way to work. The second act is set underground (the pit cage and tunnels beautifully delineated in light by Charles Webber); it is a long section and full of tension. The qualities of their movement are a reflection of both the physical effort and their underground minds, a brutal existence spurred on by chalked targets, punctuated by bells and constantly threatened by hazards to limbs and lungs. It is perhaps the first time the opening movement of Beethoven’s 5th symphony has been used at the coalface and Daniel Thomas’ soundscape exaggerates the sense of pressure and confinement until we can’t take any more. Act three takes us up again into the air to the relative freedom of a social gathering, a chance to party and to relax, which is the moment Clarke introduces the figure of then prime minister Margaret Thatcher (Eleanor Perry with the voice of Steve Nallon). This is the dramatic fulcrum of the work, the moment that defines the beginning of the end. From the intimately complex social solidarity of the first two acts, Thatcher’s intervention turns the community into a toxic, socially divisive battleground with Perry prowling like a bird of prey on one side of a picket line that bears a chilling resemblance to a gallows rope. What Clarke has achieved is an intimate, nostalgic memoir in which the material is still full of pain and anger. The work is rooted in the communities he is honouring: apart from the permanent cast of Perry, Howard and the five male dancers, the supporting characters come from local mining communities or have a relationship to them and he uses songs played by colliery bands from areas of the country in which he is performing. This close-knit network of performers strengthens the cohesion of the work, but it is the lack of artistic detachment that weakens the dramatic impact. It implodes rather than explodes, draws us in rather than spits us out on a path to change. It is designed to rouse the emotions of the audience — and is more or less successful depending on where it is performed — to reaffirm the sense of betrayal that continues today. We want COAL to succeed because what it depicts is vital to an understanding of these blighted communities and of our collective history but it falls short primarily because of its desire to entertain. The reality was and is far worse than COAL can ever admit but commemoration can also be a call to action; the struggle for the survival of the NHS is history repeating itself.